Designed to easily cut through most fabrics and soft materials, the Standard First Aid Scissors are a great asset to add to any first aid kit or have around the house. 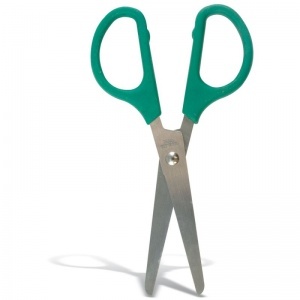 Common uses of scissors in a first aid situation include cutting gauze or adhesive bandages to size, or cutting away clothing to expose injured areas during an emergency situation. While most comprehensive first aid kits stock a standard pair of scissors, it never hurts to have a spare or two on hand. This is particularly handy if an original pair breaks or becomes blunt or rusted, and is also useful if multiple people need to be treated at once. Available to buy as a minimum of five scissors per order, each 11.5cm in length, with green plastic handles to easily grip and use effectively. Stock it in your workplace first aid kits to aid you in trimming the materials you need, without having to scour the area for a spare pair of scissors during an emergency situation. The Standard First Aid Scissors are usually dispatched via First Class Royal Mail and delivery should be within 1 to 3 working days.